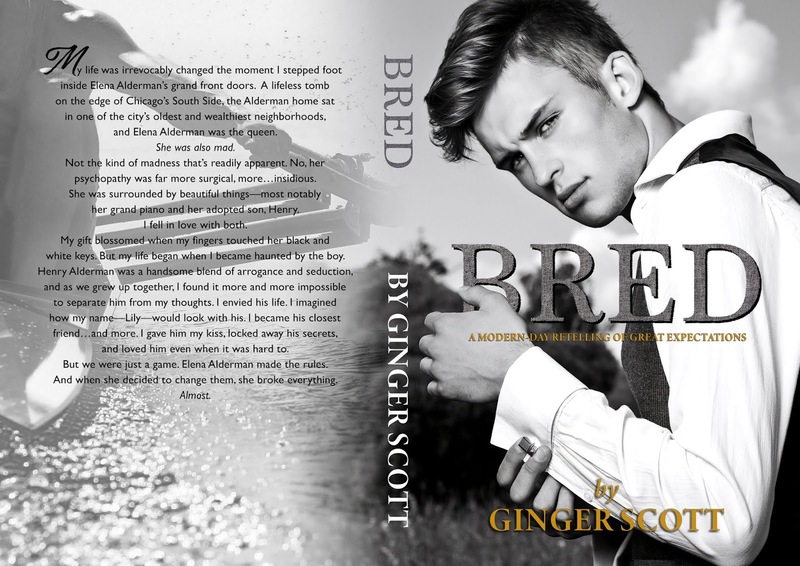 Check out this gorgeous cover for BRED by Ginger Scott! BRED is a coming-of-age romance inspired by Great Expectations you won’t want to miss! My life was irrevocably changed the moment I stepped foot inside Elena Alderman’s grand front doors. A lifeless tomb on the edge of Chicago’s South Side, the Alderman home sat in one of the city’s oldest and wealthiest neighborhoods, and Elena Alderman was the queen. Not the kind of madness that’s readily apparent. No, her psychopathy was far more surgical—more…insidious. She was surrounded by beautiful things—most notably her grand piano and her adopted son, Henry. I fell in love with both. My gift blossomed when my fingers touched her black and white keys. But my life began when I became haunted by the boy. Henry Alderman was a handsome blend of arrogance and seduction, and as we grew up together, I found it more and more impossible to separate him from my thoughts. I envied his life. I imagined how my name—Lily—would look with his. I became his closest friend…and more. I gave him my kiss, locked away his secrets, and loved him even when it was hard to.But we were just a game. Elena Alderman made the rules. And when she decided to change them, she broke everything. Ginger Scott is an Amazon-bestselling and Goodreads Choice Award-nominated author of several young and new adult romances, including Waiting on the Sidelines, Going Long, The Hail Mary, Blindness, How We Deal With Gravity, This Is Falling, You and Everything After, The Girl I Was Before, Wild Reckless, Wicked Restless, In Your Dreams, The Hard Count, Hold My Breath, A Boy Like You, A Girl Like Me, Memphis and Cry Baby. When she’s not writing, the odds are high that she’s somewhere near a baseball diamond, either watching her son field pop flies like Bryce Harper or cheering on her favorite baseball team, the Arizona Diamondbacks. Ginger lives in Arizona and is married to her college sweetheart whom she met at ASU (fork ’em, Devils).